The UK Metropolitan Police Service -- the Met, the UK's largest police force and one of the largest in the world -- has introduced a new portable fingerprint scanner. This is not the first portable scanner used by the Met, but differs from the earlier option by being developed in-house. Known as INK (identity not known), it combines software produced in-house by Met staff with an Android mobile phone paired with a Cross Match Technologies fingerprint reader. The device communicates securely with the Home Office Biometric Services Gateway (BSG), which then searches the Criminal Records Office (IDENT1) and immigration enforcement (IABS) databases. If a suspect has a criminal record, the Met says, or is known to immigration enforcement, his or her identity can be confirmed at the roadside. An officer, with relevant access levels, can also use the device to check the Police National Computer to establish if they are currently wanted for any outstanding offences. The statement made it clear that all fingerprints taken on the device are deleted automatically once the officer logs off the device. The 2017 Vault 7 CIA documents leaked by WikiLeaks seem to indicate that the CIA used a tool called ExpressLane to surreptitiously collect biometric data recorded by other Cross Match devices in the U.S.
Miami-based Cross Match Technologies provides biometric management systems to law enforcement and governments. In 2011 it was reported that a Cross Match device was used to identify Osama Bin Laden, allowing then president Obama to announce his death. For now, the Met devices cannot be used to increase the size of the national fingerprint database regardless of whether the subject is convicted of a crime. However, there seems little to prevent this development in the future. The Police and Criminal Evidence Act 1984 (PACE) allows fingerprints to be taken if a constable reasonably suspects the subject of committing or attempting to commit an offence, or they have committed or attempted to commit an offence, and: the name of the person is unknown to, and cannot be readily ascertained by, the constable -- or if the constable has reasonable grounds for doubting whether a name given by the person is their real name. Again under PACE, fingerprints may be stored by the police for 2-3 years (more if the courts grant an extension) or indefinitely if the subject is subsequently convicted of an offense. However, it is worth noting that European attitudes towards fingerprinting are changing. In April 2018, the European Commission proposed that all identity cards held by European citizens should be required to include a digital image of the holder's fingerprints. The driving force behind the new scanners is, however economy of both police funds and officers' time. Project lead Superintendent Adrian Hutchinson, explained, "Mobile identification technology helps officers to do their jobs efficiently and effectively. For example, if police stop a driver for a traffic violation but the driver has no documents on him and the car is registered to another person officers may not be happy that the name given is correct. INK can allow them to confirm the identity to allow the service of a summons, rather than arrest them and take them to a police station where they then confirm their identity. Also, if the person is wanted for other offences, this device will allow us to establish this at the point they are stopped." The reduced cost of the new devices will allow the Met to increase their usage from less than 100 to 600 devices in the field, to be rolled out over the next six months. It is believed that the failure rate for a scanned fingerprint is around one in 7,000. It is not immediately clear whether this is the same device that was described by the West Yorkshire Police earlier this year. 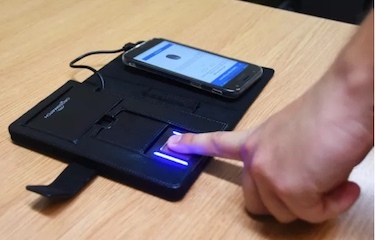 On 10 February, the Home Office announced, "An app on an officer's phone, combined with a handheld scanner, will mean police will be able to check fingerprints against both criminal and immigration records by connecting to the two live databases (IDENT1 and IABS) via the new Biometric Services Gateway... It is expected that another 20 forces across the country will roll out the system by the end of this year." A Westminster press conference that would answer such details, scheduled for Tuesday was canceled following an incident at Westminster on Monday evening. A vehicle was driven at speed into crash barriers outside the Houses of Parliament, injuring several pedestrians and cyclists. It is being treated as terror-related and investigated by the Met's counter-terrorism police -- who have said that the identity of the driver is not yet confirmed.